Solanum aviculare, S. laciniatum, S. nodiflorum & S. nigra (Solanaceae); also Poro-kaiwhiri, Hedicarya arborea, "Pigeonwood" (Monimiaceae). Alternative name: kuru, a tree mentioned in traditional narratives as growing in Tahiti or Hawaiki, from Proto-Polynesian *kulu, "Breadfruit" Altocarpus altilis. 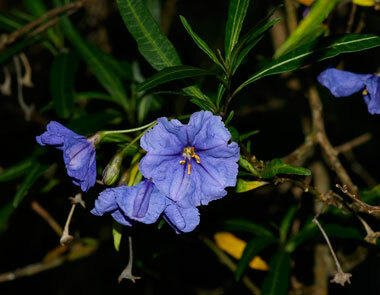 Proto Polynesian: *Polo	Solanum spp. Note: See the other linked page/s (highlighted at the top of this page) for more information about the ancestral names, their modern descendents, and the plants they denote. Kuru (Breadfruit, known from traditional narratives and chants - Artocarpus altilis, Moraceae). See linked page and further information below. 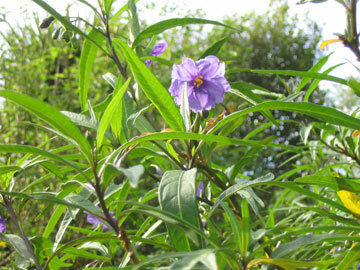 In New Zealand Māori, Solanum aviculare is also known by the locally-developed names kohoho and peoi. The fruit of S. aviculare and S. laciniatum is known as hāreo, and when ripe as hōreto or hōuto; the words kahoho, kaoho or kohoho refer to a tree bearing fruit and also to a tree which has already fruited, or the fruit itself. These terms all appear to have originated in Aotearoa. Solanum nigrum is also called raupeti, remuroa, and tūpurupuru. In Aotearoa the names pōporo and poroporo have been used to designate two small trees which are very similar in appearance -- Solanum laciniatum (illustrated on this page, with purple stems and deep blue-purple flowers) and S. aviculare (with lavender or white flowers and green stems) -- and two smaller shrubby herbs, the nightshades S. nigrum and S. nodiflorum. 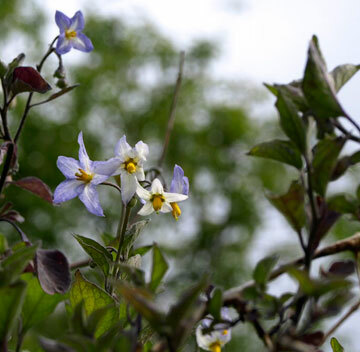 Solanum nodiflorum is native to New Zealand, although it is also found elsewhere in the Pacific; S. nigrum found its way here with people, possibly with the early Polynesian explorers, or else shortly after the first contacts between their descendents and the non-Austronesian world. With all these plants the berries are edible only when fully ripe; the unripe and partly ripe fruit and uncooked foliage is poisonous. 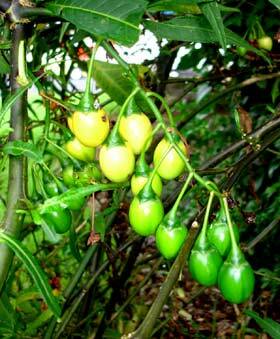 Nonetheless the ripe poroporo were once a useful supplementary food source. The trees (S. aviculare and S. laciniatum), which grow to around 3 metres tall, or even higher in favoured environments, were planted around Māori settlements where they provided fruit for children (especially) to eat and also leaves with which to line the hāngi to enhance the flavour of the meat. The fruit were also very popular with the first European settlers, who used them for jam and fruit pies, calling them "bull-a-bull" or "Maori gooseberries". They are certainly loved by birds, and most of the many plants of S. laciniatum in the garden have established themselves where birds have dropped the seeds. If you are thinking of eating them raw, don't be conned by the colour of the fruit -- they are not really ripe until the bright orange berries are starting to burst. The smaller poroporo have shiny black fruit, which may remain poisonous even when ripe, so are best avoided by human beings despite their pleasant taste. We find the two smaller smaller species of poroporo useful weed suppressants, even though they are regarded as weeds themselves (since they have heritage names, they will have a permanent place in the garden anyway). They look quite similar, but S. nodiflorum is the one with white flowers borne in fairly tight clusters. There is an excellent illustrated account of how to distinguish them apart in the linked National Museum (Te Papa) blog entry at the bottom of this page. The two species of tree poroporo, S. aviculare & S. laciniatum, have various medicinal properties, especially relating to the treatment of skin disorders, and it were an important source of the active ingredient of a modern oral contraceptive manufactured in Eastern Europe, which supported a poroporo plantation in Taranaki until disaster in the form of an unseasonal frost struck and the East European pharmaceutical companies developed a synthetic alternative to the natural product. S. laciniatum is also grown commercially in Russia, China and Eastern Europe for this purpose. 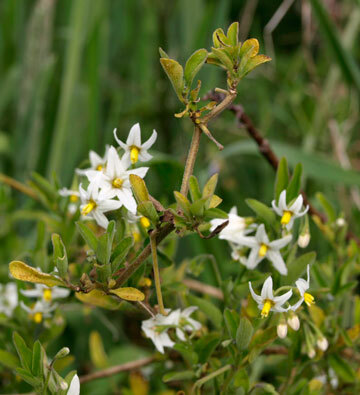 The flowers of S. aviculare are sometimes white, and, as can be seen in the photograph opposite, S. nigrum flowers also can vary in colour, even on the same plant. S. nodiflorum has consistently white flowers, but highly variable foliage. The juice from the leaves of the poroporo trees was used as a sort of glue and colour-enhancer, appled to the doors of houses or the wood of a canoe before red ochre was applied (M. Riley, Maori Herbal, p. 361). The plant name itself has colour associations, with secondary meanings of "darkened" or "black", probably in reference either to the fruits of the herbal species, or the use of the juice of the leaves of S. aviculare mixed with soot to trace the outlines of a tatoo before the incisions were made. The poet musician Hirini Melbourne used the term wai poroporo ("poroporo juice") to represent the colour violet in his song about the rainbow. The names for the various fruiting stages of the two species of poroporo trees are noted in the section on "related plant names" (above). Another meaning of pōporo or poroporo has come from the substitution of this word for the older word kuru in some references to an incident that led to the migration to Aotearoa of Tamatekapua on the waka Te Arawa. This was the consequence of a series of nocturnal raids which stripped all the fruit from a pōporo tree (clearly identified in other traditional narratives as a kuru, breadfruit) belonging to the ancestral figure Uenuku, which features in the traditions relating to the migration of the first Polynesians from the homeland of Hawaiki to Aotearoa, and metaphors referring to this tree (see Ngā mahi a ngā Tūpuna, pp. 54 sqq, and the page for "kuru"). Poro kaiwhiri, Poroporo kaiwhiri, Pōporo kaiwhiri, ~ kaiwhiria; Kaiwhiri, Kōporo kaiwhiri. These names, often written as a single word (Porokaiwhiri etc.) all refer to a tree which clearly owes them to the voracious appetites which flocks (whiri) of fruit-eating birds, especially the native pigeons (kererū or kūkupa), but also the nectar-loving tui, exhibit at the sight of its fruit. The Monimaceae are a small family of tropical and subtropical trees and shrubs, many (including the porokaiwhiri) noted for their fragrant qualities. The pukatea (Laurelia novaezelandiae) was until a few years ago also placed in this family, but botanists have now classified it as belonging to a more genetically distant group, the Atherospermataceae, leaving the single species of Hedycarya as the sole member of the Monimiaceae in Aotearoa. The taraire (Beilschmiedia tarairi, Lauraceae) is now considered to be a closer relative of the porokaiwhiri than the pukatea. The porokaiwhiri is reasonably common in lower altitude forests in the North Island, and the upper half of the South Island (extending as far as Banks Peninsula in the east and throughout the West Coast). It is also found on the Three Kings. It likes damp environments, and often develops a butressed trunk in swampy conditions. It can reach about 12 metres in height, with grey or brownish bark, like the ngaio. The leaf stalks are quite prominent -- about 2 cm long -- and the leaves (up to 12 cm long by 5 or 6 cm wide, tapering towards the tips) are usually reddish underneath, with hairy red midribs; the younger leaves are also noticeably hairy. The fragrant male and female flowers are borne on separate trees and do not have petals or sepals; the male flowers, about 1 cm in diameter, are about twice the size of the female. The fruits (drupes) are relished by kererū and other birds; they appear singly on the female flower stalks, clustered in circles, bright orange when ripe and about 1.5 cm long. Fruiting is from November to February and March. 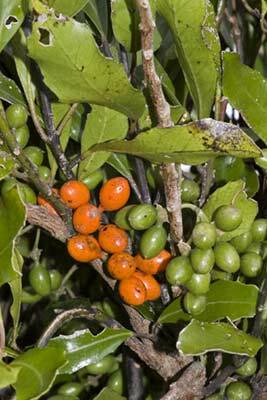 Andrew Crowe does not include the fruits of the porokaiwhiri in his book on native edible plants, and Alan Clarke (The Great Sacred Forest of Tāne, p.327) suggests that the seeds may be poisonous. The pahū was still being used to sound the alarm when the infamous Colonel Whitmore and his troops invaded the Urewera Country in 1869. When porokaiwhiri wood was not available tōtara or matai (Prumnopitys taxifolia) would be substituted, but the superb acoustic qualities of porokaiwhiri made it the material par excellence for this use, and also for the pūrerehua, a children's toy something like a bullroarer, and some other musical or sound-producing instruments. works referred to will be found in the bibliography, along with those of other books on New Zealand trees and plants. Those by J. T. Salmon and John Dawson and Rob Lucas have excellent illustrated sections on the porokaiwhiri and the tree poroporo. Photographs: The inset photograph of Solanum laciniatum fruit was taken by (c) Peter de Lange and that of porokaiwhiri fruit and leaves by (c) Jeremy Rolfe, both members of the NZ Plant Conservation Network. 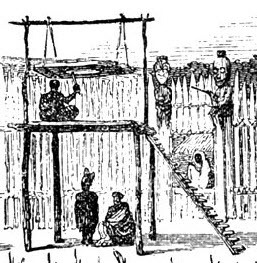 The inset illustration of the pahū is a detail from the title image for Volume 1 of Arthur S. Thomson's The Story of New Zealand, Past and Present: Savage and Civilized, London: John Murray, 1859. The other photographs were taken in Te Māra Reo or Hawai'i by R.B. This species is not native to Aotearoa, but has been naturalized for more than a century, and possibly much longer. It could well be another "canoe plant".